Is anything better than bacon? I have heard bacon called the gateway meat. Those who are vegetarian end up eating meat because of bacon. I believe it. I first saw this recipe in Rachael Ray's magazine. It is a Guy Fieri recipe. He placed it on top of grilled romaine lettuce, which is a great combination. However, sometimes grilling lettuce is a pain. Then you have to take the extra time to cut up the lettuce in pieces later. I am a lazy salad eater. I like little pieces of lettuce and goodies that can be easily eaten in one yummy bite. Then you have all the flavors of the salad on one fork. But first let's compare. 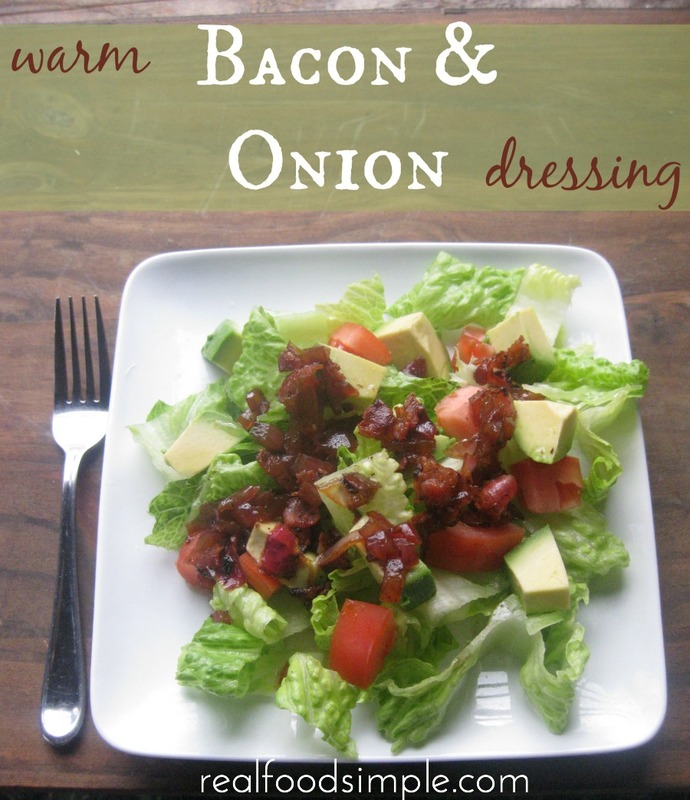 I could not find a warm bacon dressing bottled but I did find a tango tomato bacon dressing which I thought would be a closer match then a creamy ranch style bacon dressing. Here are the ingredients. 1/2 onion - diced; I like using red, but you can also use white or sweet. Because you will be cooking it, the sweetness of the onion comes out. In a skillet, cook the bacon over medium heat until nice and crispy. Take out the bacon, but do not discard the bacon fat. Add the diced onions to the bacon fat and cook until soft and translucent, 5-10 minutes. Add the balsamic vinegar and cook it down about 5 minutes. Remove from heat and add the olive oil. I served this over some romaine lettuce with tomatoes, avocado and crumbled blue cheese. The pungent blue cheese is a perfect pairing with the sweetness of the dressing. *If you don't mind a bit of routine, eating the same thing a few days in a row or a few days in a week is an easy way to eat more real food. Real food usually takes a bit more time prepping and cooking. Instead of prepping each meal each time, prep once eat twice or thrice. I have done a series of homemade dressing and sauces, where you can find all of them listed with links.